The City of Tampere is a front-runner city in EU Horizon 2020 project Urban Nature Labs, where Nature Based Solutions (NBS) for climate change driven problems are co-created, demonstrated, monitored and replicated. In UNaLab, the City of Tampere focuses on 1) Adopting and further developing innovative nature based stormwater management, 2) Monitoring performance in boreal/artic climate conditions, 3) Developing the City’s administrative processes, and 4) Finding business models for the implementation of the NBS in the future. The City of Tampere has two UNaLab demonstration areas, or Urban Living Labs: Vuores and Hiedanranta. Vuores is a construction phase green district in the middle of natural waterbodies. Vuores’ stormwater management system is one of the largest in the Nordic countries possibly the northern hemisphere. Hiedanranta is a planning phase brownfield area that aims to be a smart, sustainable and dense centre of Western Tampere where new ideas, pilots and urban culture flourish. Spring 2018 was an intense co-creation period in the Living Labs: a series of three (Visioning – Ideating – Testing) Design Thinking workshops were organized in each area, for a total of six workshops, and they attracted altogether 258 participants (Table 1). The aim of the co-creation activities was to further develop preliminary NBS demonstration ideas, create new ideas and raise awareness of the novel concept of Nature Based Solutions. Participants included citizens, NGOs, public and private sector actors, and representatives from universities. The UNaLab co-creation process was supported by project partners, especially the European Network of Living Labs (ENoLL) and Ramboll Oy. The Design Thinking co-creation method proposes inviting the same wide group of stakeholders to each workshop. In Tampere, we modified this approach slightly such that each workshop was targeted to a specific focus area and to different stakeholder groups. The co-creation workshops in Tampere were also integrated with other events and urban planning processes in the city. This adaptation of the Design Thinking process was due to the assumption that it is difficult to attract participants to (three) co-creation events, and that R&D&I project activities are easily marginalized from dominant urban development processes. - Method: Design Thinking (visioning phase). Focus on three themes: water, biodiversity and recreation. - Goal: Create a shared vision of the Vuores NBS living lab: development needs and ideas, best practices and to learn from the current NBS. - Participants: 26, Vuores residents, NGOs, experts from the City of Tampere. Facilitator RAM. - Goal: Bringing the ideas from the first workshop to a more concrete level + sparking some new and concrete ideas for NBS in future Hiedanranta. - Participants: 69, Professionals / experts in city planning, architecture, building, maintenance etc. Some from the public sector (e.g. City of Tampere), some from the private (architect or maintenance firms etc. ), some from the universities. Facilitator Regio Hub. - Goal: To raise awareness of NBS in Vuores among the pupils and teachers, collect ideas to develop NBS further as well as to give the pupils tools to monitor water quality and biodiversity. Also to get experience about organizing a workshop with children. - Participants: Total number of participants 101; 87 pupils, 6 teachers, and 8 representatives from the city of Tampere, Ramboll and VTT. Facilitator RAM. - Goal: Developing the ideas from WS1 & WS2 further, hearing citizens’ opinions of them, especially asking opinions about NBS for contaminated waters and also already existing NBS on the area. Finding possible spots for demonstrating some of the co-created ideas in the near future. - Participants: 18, nearby residents. Facilitator Regio Hub. - Goal: Development of nature based solutions in Vuores and collection of good practices possibly transferred to Hiedanranta area development. Third workshop in the co-creation process. Identifying the real needs of the different stakeholders involved, empathizing especially with the point of view of citizens. Testing the ideas found in the 1st and 2nd workshops. - Participants: 20, residents + over 100 visitors at Unalab info desk. Facilitator RAM. -Recreation: Utilizing lake Näsijärvi and industrial heritage. -Biodiversity: Valuable natural areas should be left unbuilt. Inner yards and buildings could belong to the blue-green network. -Water management: Multi-fuctional blue infrastructure. Industrial history needs to be taken into account (treatment of contaminated waters, reuse of old wastewater treatment ponds). -Recreation: More accessible green areas that encourage physical activities. -Biodiversity: More city green and also wilder parks. -Water management: Novel NBS to protect water quality and more info regarding NBS. Before co-creation, initial NBS demonstration ideas included: further development of Vuores’ nature based stormwater management system with, e.g., biofilters and plot-scale NBS. There were also plans to test green roofs/walls and demonstrate micro-algae performance in water purification. In addition, online water/NBS performance monitoring was highlighted in initial plans. Co-creation activities resulted in some significant changes to the preliminary NBS plans. 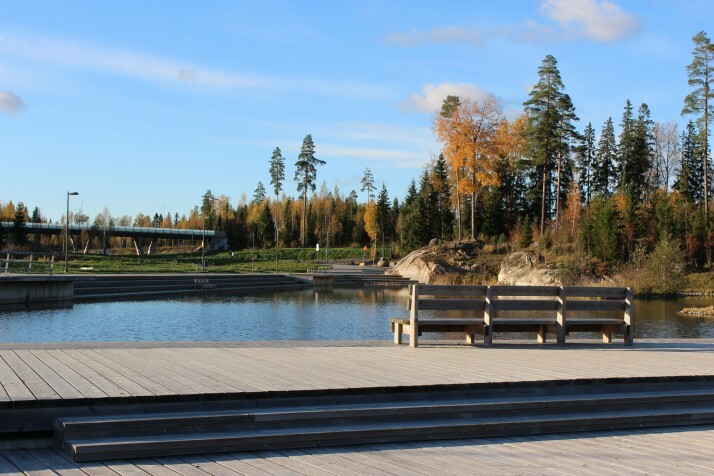 In Hiedanranta, a new demonstration – a biofilter to manage seepage water from an old pulpmill landfill - was introduced because during co-creation activities the recreational value of lake Näsijärvi was highlighted and smells from old industrial fibre waste were seen to hinder that value. A local biochar producer participated in the co-creation process and the company’s products and expertise were used in the biofilter demonstration. The need for the initially planned green roof demonstration was highlighted in Hiedanranta, as one of the outcomes of the co-creation process was the idea of connecting inner yards and buildings to the blue-green network of the area. Some ideas collected in Hiedanranta co-creation activities were passed to city planners (e.g., use of industrial heritage, leaving valuable biodiversity areas unbuilt) as the master plan of the area is currently being developed, and many NBS will be implemented after the UNaLab project is finished (next 5-10 years). In Vuores, hopes for wilder nature (e.g., selection of plants) and encouragement of physical activities + accessibility (e.g., building duckboards) were taken into account when planning Vuores nature-based stormwater management systems and surrounding parks. Vuores residents were particularly interested in local water quality; the recently-implemented online monitoring will provide residents with up-to-date information about local water quality (https://ehp-data.com/). Furthermore, children’s role as “nature cops” monitoring the NBS has been enhanced by delivering water quality monitoring rucksacks to Vuores school and educating pupils to monitor water quality and macroinvertebrates. Demand for NBS information was fulfilled by creating interpretive signs to NBS sites and providing NBS information online (www.tampere.fi/unalab). UNaLab NBS demonstration plans were updated as a result of co-creation activities, but first and foremost, co-creation was a two-way learning processes. Nature based solution is a novel concept, which tends to act as an umbrella to more established concepts of ecosystem services and green infrastructure. Furthermore, climate change driven problems are presently not as severe or visible in Nordic countries compared with many southern regions, which can make NBS seem less relevant. Subsequently, NBS education in different forms – the UNaLab NBS handbook and its Finnish version, classroom teaching and field trips with school children, expert seminars, expert lectures on water quality trends in Vuores area and interpretive signs - were crucial and appreciated components of the learning and co-creation process. Finally, to make co-creation a successful tool to urban planning, we need to examine it critically. As pointed out by Voorberg et al. (2015) in a review of co-creation/production with citizen in public innovation, co-creation and co-production often seems to be a virtue in itself, and typically the questions ‘how co-creation and co-production can be established’ and ‘what is needed in order to do that’ are asked, while the question ‘why one should co-create/co-produce’ is very often not asked. In Tampere, we have been discussing these questions in the context of UNaLab and the co-creation of nature based stormwater systems. These systems are characterized as integrated (grey-green-blue) infrastructure, whose planning requires expertise in environmental protection and engineering. What is the role of civic society in such planning? Are local residents interested in participating? How do we include the voices of under-represented groups? Are municipal and urban planning processes flexible enough? How is this specific focus (NBS/stormwater) or project (UNaLab) related to the wider urban development perspective? Literature gives some, but not NBS focused, answers. What is needed to make urban living labs and co-creation impactful is long-term commitment beyond one project life-time (Fraz et al. 2015). In addition, we need to consider the characteristics of the administrative culture and compatibility of the public organization’s systems, routines, and procedures with citizen participation. As well as citizen awareness, intrinsic values and the presence of social capital are important (Voorberg et al. 2015). M.Sc. (Tech. and Admin.) Maarit Särkilahti is a professional with 10 years experience in water and waste management. Her fields of expertise include circular economy, especially nutrient recycling, and nature based storm water management. Currently she works as a project manager in City of Tampere, Finland. In addition, she is finishing her dissertation in Tampere University of Technology, Laboratory of Chemistry and Bioengineering. She studies sustainability transition in infrastructure sectors with interdisciplinary approach.